Mating bladders 2, originally uploaded by ozzicada. 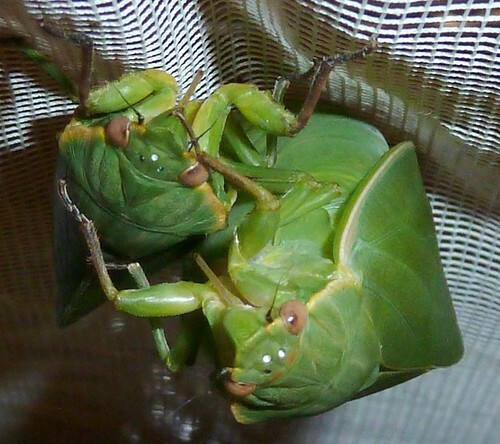 An excellent photo of mating Bladder cicadas (Cystosoma saundersii) by David Emery. Thanks to David Emery for letting us know that the Bladder cicadas (Cystosoma saundersii) are out in Sydney Australia, and for providing this photo. Badder cicadas are emerging down the Aussie east coast starting around the Queensland -NSW border on Sept 3 (FlickR) and we heard them for the first time on Sept 10 in Sydney. A photo of one captured on Sept 12 is attached to refresh Cicadamania devotees. David Emery send us a photo of a Cystosoma saundersii (bottle cicada) from Australia and we added it to the gallery. Just to complement the Aussie cicadas, a small colony of these Cystosoma saundersii (bottle cicadas) have been droning and rattling at dusk around Burwoood in Sydney for the past 2 months. This is their southern-most extension down the east coast of Australia. Click the link above or the image below to access large versions of the image. More information about Cystosoma saundersii on the CSIRO site.